One of the most memorable travel experiences I could imagine would be discovering a place on the planet of extraordinary beauty that I had never known about - but had lived very close to over forty years ago in upstate New York. Straddling both the State of New York and Ontario, Canada, this archipelago of the Thousand Islands (really about 1,800 islands) is one of the most beautiful waterways in North America and attracts visitors and seasonal residents to enjoy the confluence of the Great Lakes (Huron, Michigan, Ontario, Superior, and Erie) as they flow into the St. Lawrence River/Seaway headed into the Atlantic Ocean. People with a variety of lifestyles are drawn to the region, especially East Coast residents and Canadian families, plus the rich and famous from Europe and Asia. They are attracted to North America's most panoramic and eclectic mix of riverside abodes and scenic vistas. There are structures from the lean-to, cabin, contemporary two story and ranch style homes, to mansions and a few castles, all posed in a picture perfect nautical setting, many with lush forest cover. My close-up view of the Thousand Islands was from the deck of a sparsely populated ferry boat cruiser that steered close to the islands, some with iconic buildings and structures (including at least 100 of the islands). This year on a warm and sunny September day my leisurely two hour cruise through very clear waters on a Uncle Sam's Ferry, included commentary on legends of the waterway, and accounts of the development of the region from the late 1800s to the present. As a Midwesterner, I learned that Chicago-based Pullman Railroad car developer, George Pullman, was one of the early industrial giants to bring national attention to the islands when he built a summer cottage on one island, and invited his rich friends to discover the enticing ambiance of the waterway. Soon dozens of masters of the universe (mostly from New York) were building fancy fishing cottages on the islands and mooring their boats while enjoying a summer escape from the bustle of the big city. Over the decades less wealthy families who enjoy fishing, boating, and water sports, have built more modest get-away accommodations on hundreds of these islands both in New York and Canada. There are still dozens of unoccupied islands, many of which are populated bird perches and sanctuaries. The Thousand Islands are, I learned, at their most sublime in the summer. Between May and September thousands of tourists descend to the region and populate not just the waterways and islands, but clusters of nearby delightful little towns in New York and Canada. My arrival came at the end of the high season when there was easy occupancy availability in B&Bs, motels and a newer delightful 4 Star hotel, the elegant 1000 Islands Harbor Hotel, perched right on the water. I have lived across the street from or within short walking distance to Lake Michigan for over 30 years of my life. When I didn't have this particular privilege in Chicago, I fondly recall my life on the West Coast when I lived across the street from San Francisco Bay and Rochester, New York where Lake Ontario was close to my little apartment. I guess, as any Pisces, I am drawn to the waterways. My visit to the Thousand Islands was a special treat. It was an introduction to one of nature's special gifts to the continent that I should have known about, but didn't. It was a discovery that I will be sharing with whomever will listen to my high praise for this exquisite resort region, for years to come. I came to the 1000 Islands to see the castle of Love - Boldt Castle - the early 20th century castle built for Louise, the wife of Waldorf Astoria hotelier George Boldt of New York. The love story of this couple of swells has permeated the legends of the islands for over 100 years. I read about Boldt's desire to build a love retreat for his wife and family, including a son and daughter, beginning in 1900 on his favorite getaway, Heart Island on the St. Lawrence River. The island has been a tourism mainstay on the Thousand Islands for decades. Basically shuttered since 1904, construction resumed in the 1970s for the anticipated public opening of several of the 100 plus rooms and grounds of this Germanic inspired estate. Construction and renovation continues today. So I made the pilgrimage by Uncle Sam's Ferry and toured the property. A little history: Boldt was inspired to erect a prominent edifice on his island for his beloved wife. She unexpectedly died in 1904 in New York four years after the beginning of construction. When Mr. Boldt received the news of her untimely death, he notified his construction superintendent and requested that work stop immediately. It was, and Boldt never returned to the site. No explanation. However, rumors of the "real" story behind the work stoppage on the project have circulated for decades, including a book on the "true" story of the Boldt marriage alliance. The castle and other structures on the island deteriorated over the decades and since many of the buildings then under construction were open to the elements, the property became an eyesore. The Thousand Island Bridge Authority took the property over in 1970 and has secured public and private funding for reconstruction and renovation of the castle and other buildings on the island. Progress has been steady but slow with millions of dollars invested so far and a lot more work to be done. Visitors arrive by boat or ferry to the castle. Parts of two floors are open and furnished with period pieces that represent early 20th century decor. There is a small theater on the second floor that shows a short video describing the life of the family. Several public areas and rooms, including an imposing mahogany staircase, a ballroom, billiards room, dining room, spectacular stained glass ceiling, and kitchen have been expertly restored, while some finishes, furniture and masonry have been recreated from architectural drawings from the period. The grounds of the estate are beautifully manicured and offer luscious paths for strolls and picnics. There are also outdoor outlets for refreshments, gifts and comfort stations. 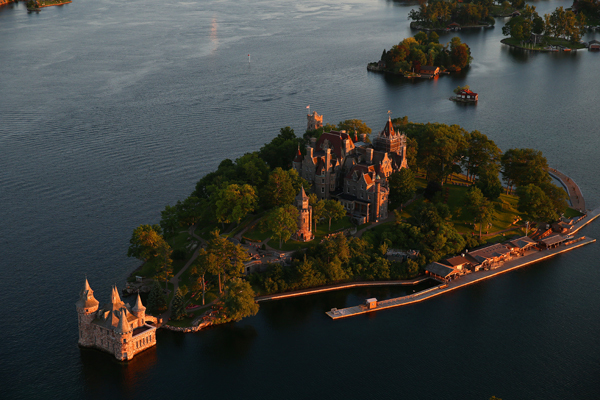 Boldt Castle is certainly the major attraction in the Thousand Islands region. But there is another castle, Singer Castle, on Dark Island, open to the public with some spectacular attributes and history. Completed in 1905 as a summer getaway by Commodore Frederick Bourne (founder of Singer sewing machines) and modeled after the Scottish Castle Woodstock, it was occupied by family members until the 1960s and is now a tourist attraction open to the public. Both of these opulent estates are magnets for visitors who wish to see the lifestyles of eras long past and to make an acquaintance with a waterway that frames them both. To learn more - visit1000islands.com.